Please use this thread to discuss all things related to Entertainment Earth exclusives for Comic-Con 2018. "For San Diego Comic-Con International this year, Entertainment Earth is digging back into the title that started it all, with an exclusive set of 16 stylized wooden Pin Mates from the iconic original storyline that we're pleased to debut right here." A beloved, time-honored Japanese art form meets modern superhero fandom in the Convention Exclusive Wittles Wooden Doll, only from Entertainment Earth! Farmers in Japan’s Tohoku region started lathing simple round-headed, cylindrical wooden figures during the Ōgosho Period (1804-1829). They hoped these carvings would protect their homes and families, and maybe even bring abundant crops. Or they may have simply been whittling to pass the time during the winter. Eventually, their children started playing with the dolls. It’s not hard to see why. The red and yellow paints used to decorate them caught kids’ eyes, and the well-balanced, small, smooth figures were a perfect fit for young hands. In the 20th century, especially after U.S. servicemen came home from World War II, kokeshi dolls attracted the world’s attention and became popular collectibles. To meet foreign demand, Japanese artisans started producing a wide variety of figures, often experimenting with new shapes and colors. Enthusiasm for kokeshi figures continues to surge today. The new Convention Exclusive Wittles Wooden Doll pays homage to the vibrant kokeshi tradition while celebrating one of today’s most popular female superhero. Doreen Green, who fights crime as Squirrel Girl, is a relative newcomer, joining Marvel’s Super Hero ranks in Marvel Super-Heroes #8: Winter Special (1992). But she’s proven herself against such big bads as Doctor Doom, Malestrom, Galactus, and even Thanos! The Squirrel Girl Wittles Wooden Doll – Convention Exclusive depicts Doreen ready for action in her fabulous furry regalia. The doll stands about 4-inches tall and boast vibrant, detailed, 360-degree artwork, meaning they look super from any point of view. It also comes with a holographic sticker authenticating its limited-edition status. 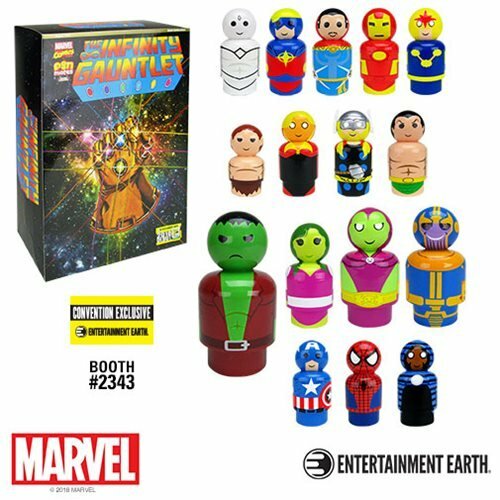 The first opportunity for fans to grab the Wittles Wooden Doll will be at San Diego Comic-Con on July 19, 2018, at the Entertainment Earth booth #2343. Hurry – there are only 1,500 of the Wittles available! Not attending San Diego Comic-Con 2018? Pre-order* the Wooden Doll at Entertainment Earth now! Continue to check Entertainment Earth for the latest convention exclusive news. *NOTE: This item will be sold separately during San Diego Comic-Con 2018 at the Entertainment Earth booth #2343. If supplies remain after the show, pre-orders will be filled and shipped to you then, in August 2018. Now you don't have to just love @Lin_Manuel and Tobi from afar. Thanks to the collaboration of @TeeRico_LinMan and Entertainment Earth, the musical maestro and his pup have been turned into Pin Mates™ with the Lin-Manuel Miranda and Tobi Pin Mates™ Set! The man who dared you to believe in happy little trees and clouds can bring delight to you once more as this high-quality collectible. San Diego Comic-Con is less than a month away, but the DC Collectibles team is ready to reassure everyone that everything is going to be fine. How can they be so sure? Simple: They’re bringing not just one, not just two, but three Batmen to the show, in the form of exclusive vinyl figures designed by illustrator Chris Uminga. Three variants of Uminga’s vinyl Dark Knight — sculpted by Joe Menma and painted by Michael Cowart, based on Uminga’s design — will be available during this year’s show, running July 19-22 at the San Diego Convention Center. Each one is a limited edition, available exclusively from the Entertainment Earth booth at the show (#2343). The 6.75-inch figures, part of DC’s Artists Alley line of collectibles, will span the history of the comic book caped crusader, including a version based on his classic Silver Age costume (limited to 1,500 units and priced at $60), a version of the alternate Batman from 2011’s Flashpoint comic book series (750 units, $75) and an ultra-rare matte black-and-gold edition, which comes with a hand-drawn sketch from Uminga of Batman, Superman, Wonder Woman or the Joker (300 units, $100). Each figure comes with a collectible character art card. For those not attending the show, there’s still a chance to pick up the figures…perhaps. Preorders are available online as of today, and unsold supplies will be available for shipping in August. Inspired by the #DragonBallSuper anime series, this Dragon Ball Super Super Saiyan Rose Goku Black FiGPiN Enamel Pin – Convention Exclusive is a premium hard-enamel 3-inch FiGPiN that’s detailed and able to stand up with its signature rubber backer stand. Problem with Entertainment Earth is they don't offer pickup at SDCC 2018. I would be buying a lot if they did. Can somebody school me on Entertainment Earth Exclusives. Are they typically actual "exclusives" or are they easily available after SDCC for purchase? Also, how does their presale/booth typically work?